It was Little B’s Dussehra vacation time last year. With almost two weeks of holidays to pass, we were getting bored. I started looking for projects that can consume at least a few of these days, the more the better. Somehow I ended up reading this really old link where a group of high school students made a newspaper shelter. 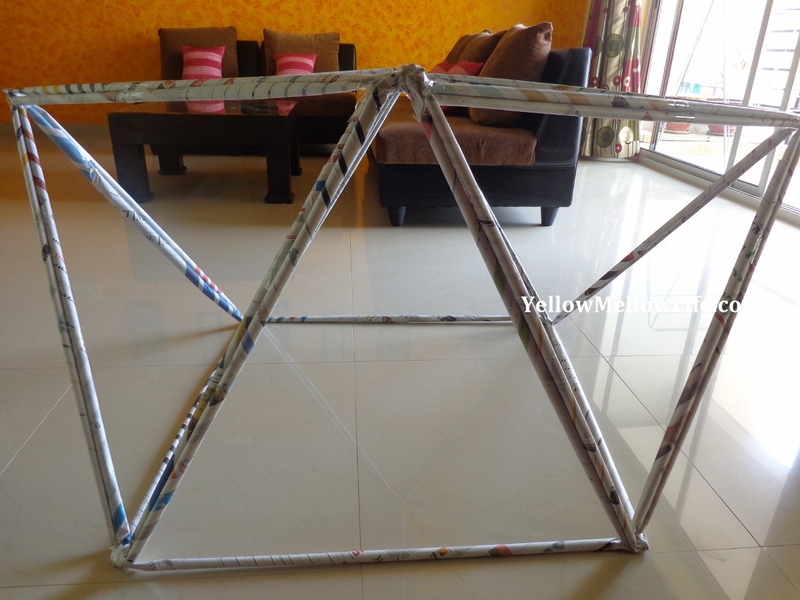 I was impressed by the fact that an ok-sturdy structure can be made out of newspapers! So I wondered how can I do the same activity with Little B. And then Allison Waken from All For The Boys came to my rescue. 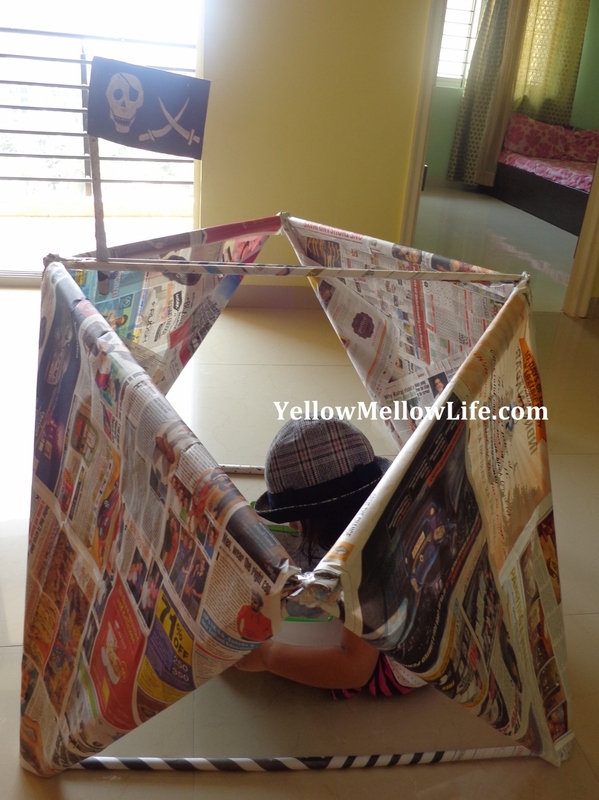 Allison has this fascinating activity where she makes a newspaper fort with her boys. 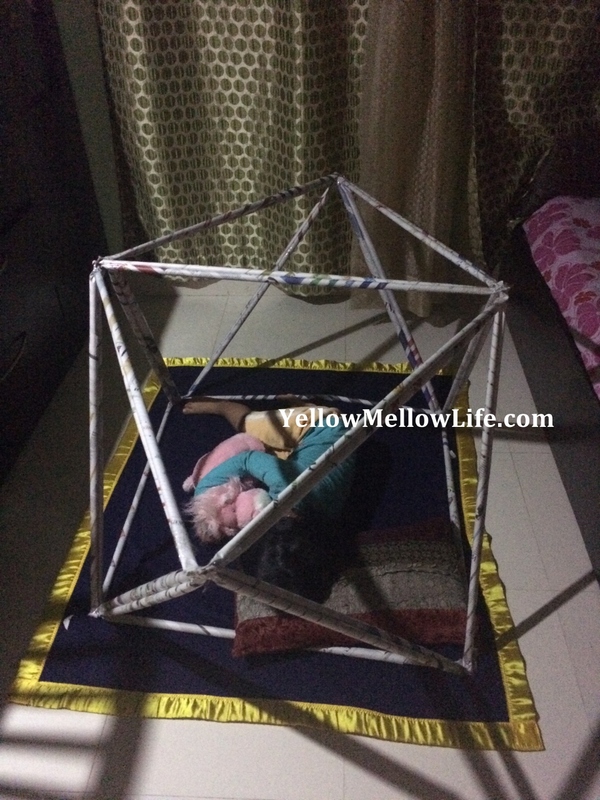 Well, it sure looked like a simple and yet time consuming activity – easy and yet challenging enough that might keep Little B engaged. 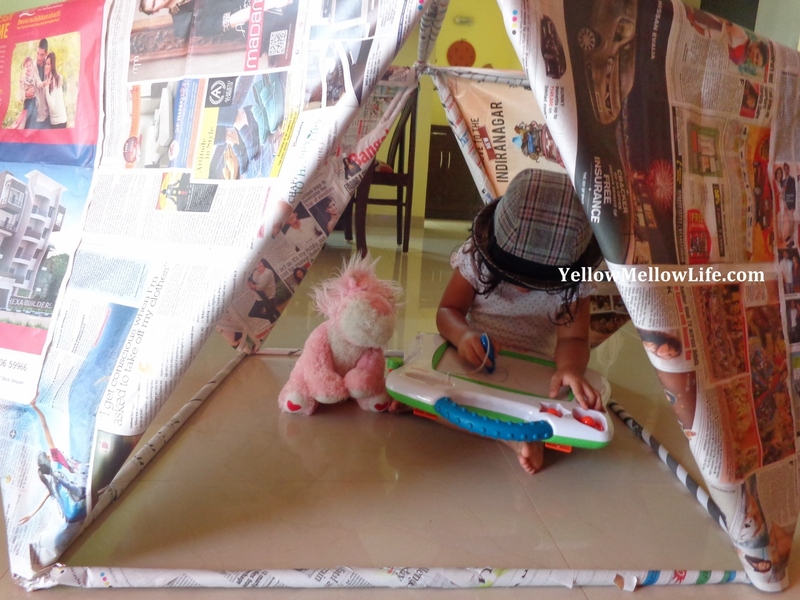 My initial idea was to make the same newspaper fort with some modifications here and there. 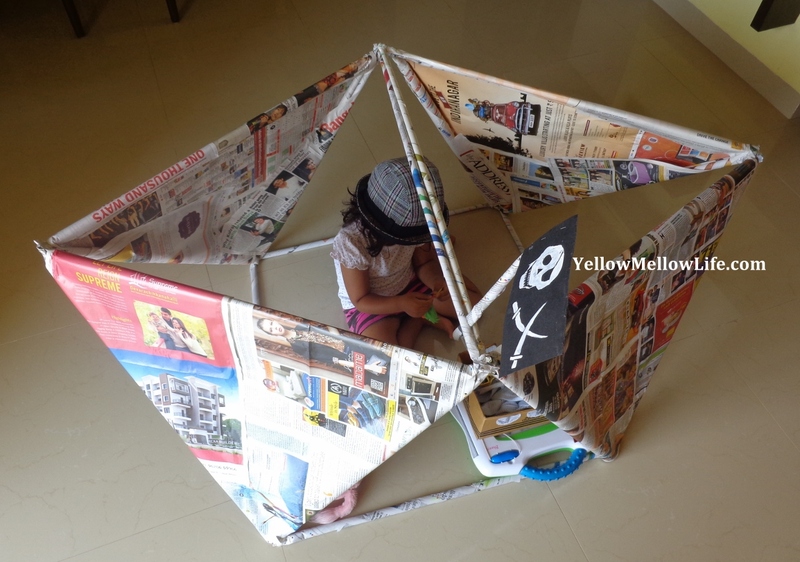 But I ended up making a newspaper pirate ship instead. Take one sheet of newspaper. You have to start rolling it from one corner and keep rolling it till you reach the end of the sheet. Secure the end with a cello tape. 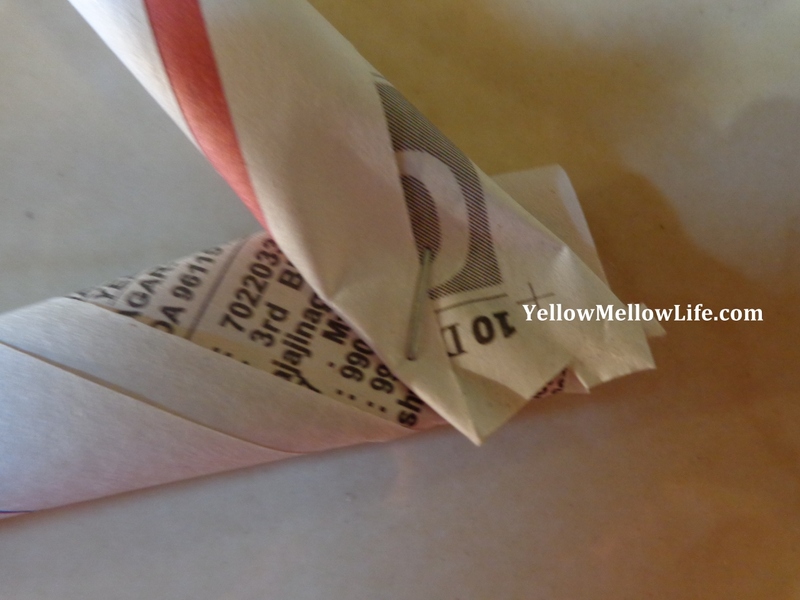 You have to basically make a stick out of a newspaper sheet. The important thing is that you should try making this roll as tight as you can. 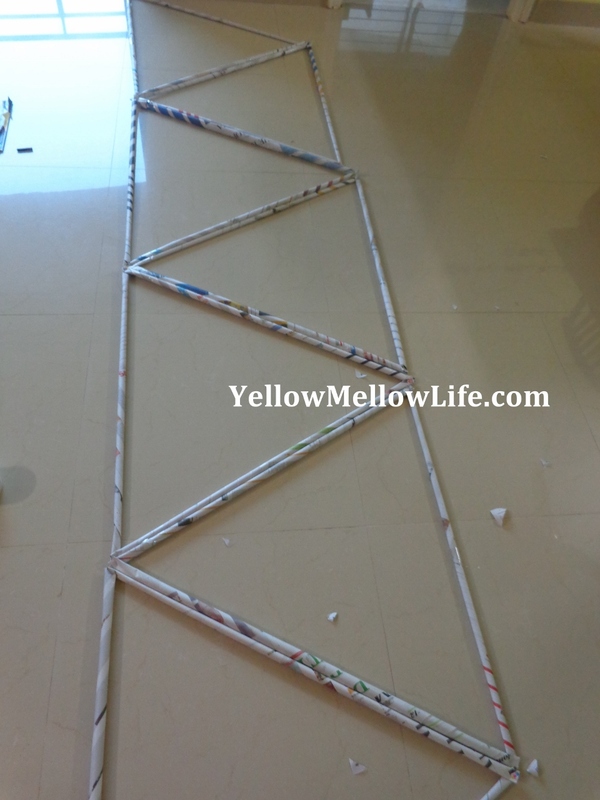 Tighter the roll, sturdier the final structure that you are making will be. I made around 30 such sticks. I also cut the ends off the sticks and cut them equal in length. Next thing is to take three sticks, join their ends together and make a triangle. I stapled the end and taped them around as well to make the joint strong. As the sticks are approximately equal in length, you should have equilateral triangles. I ended up with 10 triangles in total. Out of these, I joined 8 triangles together by alternating between one kind of right-side-up triangle and then an upside-down triangle. For joining these triangles, again use stapler and further fortify with a good length of cello tape. I added the remaining 2 triangles on the top to further strengthen the ship. The entire structure is made out of newspapers, so you would have to use cello tape quite generously. 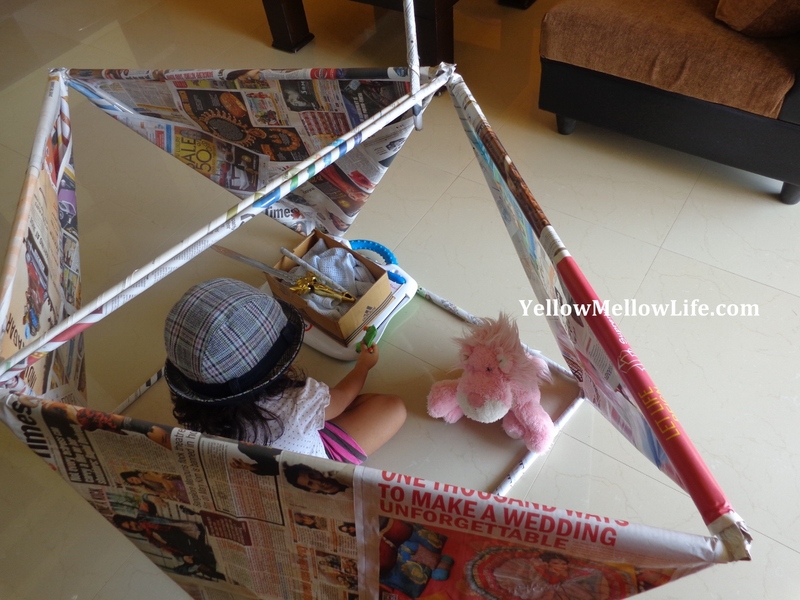 Initially the structure might look flimsy but it is stable enough for a child to pretend play in it for a week or two. We stopped here for the day. Little B decided to sleep in the structure for the night. I glued sheets of newspapers on four of the side triangles to bring it all together. What would be a pirate ship without a flag ! I felt so proud drawing a pretty decent Jolly Roger. Little B filled her pirate ship with whatever she thought that a pirate would need – parrot, dog, sword, doodle and yeah lot of stuff. I know I went too elaborate with the whole thing. As I pointed out earlier, my aim was to do an activity that can go on for days and this one sure did. We extended the activity for 3 days. Little B played with the pirate ship for all through her holidays and even days after. You do not have to make such an elaborate structure. The most basic newspaper structure would require just 4-5 triangles. Or, you can go further than what I did here. Once you make these triangles, you will realize that they are just like building blocks. There are endless possibilities for what all you can make out of them. Happy Father’s Day Everybody! And Happy International Yoga Day as well! Hey Kausar, thanks for taking time to read my blog. You must have heard the proverb – necessity is the mother of invention. That’s my inspiration. My daughter is restless and the only way she concentrates is when she is actively engaged in something. That apart, thanks again for your kind words. For future blog posts, please subscribe at the main page of the website. Or you can follow my page on FB https://www.facebook.com/yellowmellowlife. Feel free to share it with your friends as well! Too good bhawna and hats off to you for your patience and the time u give to ur child…..truely impressed….keep it up. Previous story What Should I Do With You Pakistan?